This is a very basic, practical introduction to transposing for the ukulele. In this post I cover what transposition is and why it’s useful. I also discuss four tools for transposition: a chord chart, an online transposer tool, a capo and barre chords. Many ukulele players will find enough here. But some adventurous musicians will want to know more than this. I’m planning a follow-up post with more details. Transposition is a piece of music theory that’s very useful to know about when you’re organizing or selecting ukulele parts. It’s part of a big, complicated field of knowledge. What I’m covering here in this post is just a very small piece. But it’s a very handy piece. It’s about shifting the pitch of a piece of music, to make it either higher or lower. The key is a group of pitches that form the harmonic and melodic framework of a piece of music. The most common key for ukulele songs is C, because that’s easiest to play on a ukulele that’s tuned in C. (This is the most common ukulele tuning system, and the one I use.). A three-chord song in the key of C will usually have the chords of C, G and F.
When we transpose a song into a different key, the chords will change. Here’s a Youtube video where I explain and demonstrate transposition. Before I go any further, here’s a practical example of transposition. Here’s the Happy Birthday song in three different keys. Try playing and singing each of these versions and you’ll see what a difference it makes. 1. To make the song easier to play on ukulele. Some keys are difficult to play on ukulele, and some are easier. E is a popular key for guitarists, but it’s a difficult key for ukulele unless you can play barre chords (see below for more about these). When I find a song in E, I shift it into another key, using the methods I’m sharing with you here. 2. To make the song easier to sing. Singing while I play ukulele is very important for me. And also for my friends in my ukulele group The Strumbles, which has eight women and one man. Many popular songs are pitched for men’s voices. E.g. John Lennon’s song Imagine is easy to play on ukulele in C, which is the original key he sings it in. But for women’s voices the key of G is much better. Matthew, our bass player (and the sole male Strumble), sings harmony when the pitch of the melody doesn’t suit his voice. When you’re trying your hand at transposition, I strongly suggest starting with a three-chord song. If a song has only three or four chords, transposition is easy. You can use the chart below to figure out the chord relationships. Here’s a link to my post about the joys of three-chord songs. I include a list of 70 great three-chord songs. When there are more chords, things may get trickier – especially if you’re dealing with minor keys. I’ll explain more about that in a future post. You can use this chart to figure out the chord relationships in different keys. When you go looking for song charts on some popular music websites, e.g. UltimateGuitar.com and Ukutabs.com, you’ll often find that the songs include chords that are hard to play. 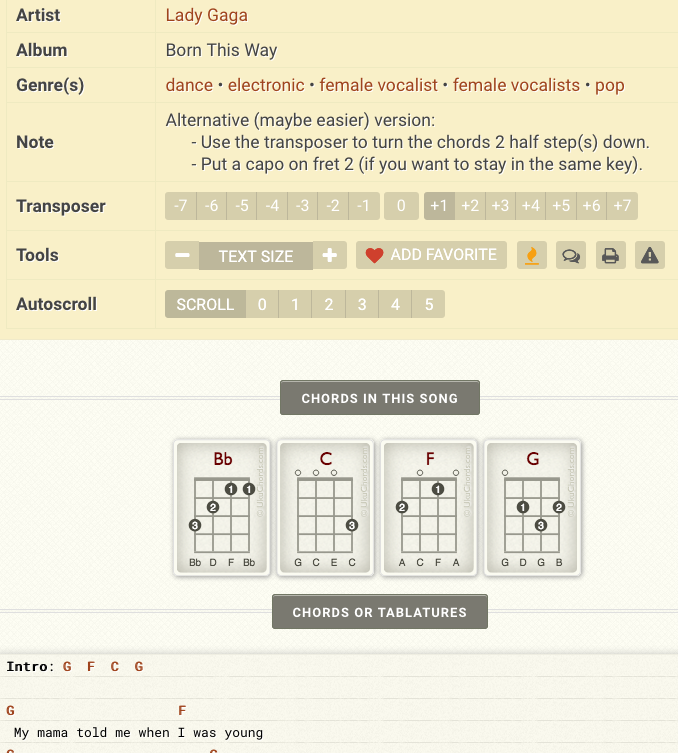 But there’s a transposer tool that you can use to change the chords on the song! On Ukutabs.com the transposer tool is above the song; on UltimateGuitar it’s at the bottom right. It has little “plus” and “minus” signs. Keep going, step by step, until you like the look of the chords. Here are two screenshots of Born This Way, by Lady Gaga, from Ukutabs. The first one has the original chords. 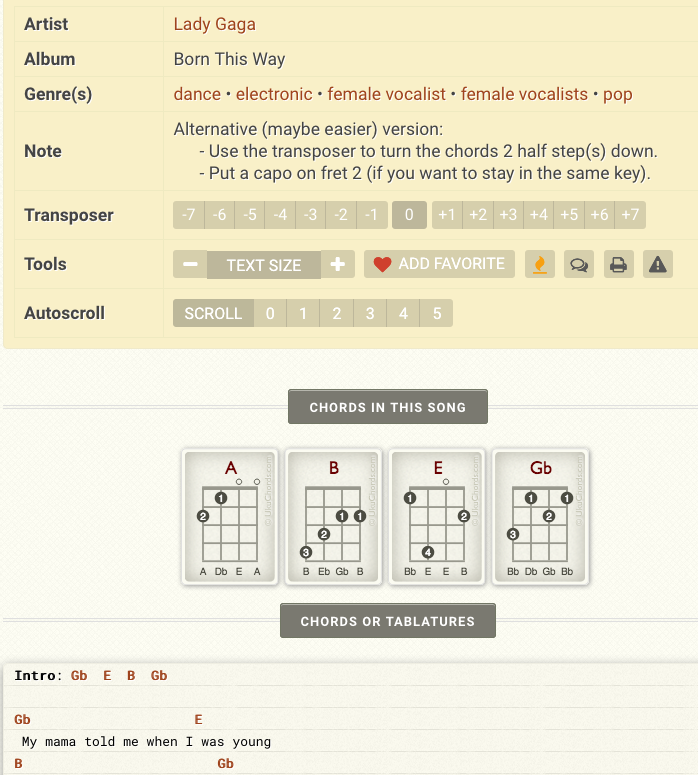 In the second example I changed the chords using the transposer tool. I know which version I’d rather play on ukulele! NB scroll down below the yellow part and don’t read the notes – they’re not relevant if you change the chords. The C, F, G version is going to be much easier to play. Don’t worry about the Bb chord – it doesn’t actually appear in this three-chord song. I don’t know why it’s there. Maybe to scare people? A capo is a gadget that attaches across the ukulele fretboard. Each fret represents a semitone in pitch. If you attach the capo on the second fret, your ukulele in C will now be playing in the key of D. When you play the C chord shape, you’ll be playing a D chord. When the capo is on the fourth fret, your C chord shape becomes an E chord. Capos are commonly used by guitarists. They’re much less common with ukuleles, mainly because of tuning problems. If (like me) you have a cheap ukulele – i.e. under $300 or so – it will probably be out of tune if you use a capo. That’s because the neck isn’t completely straight. If you have a better quality ukulele, you could consider getting a capo. Barre chords (pronounced “bar” chords) are not for absolute beginners. Getting your hand used to barre chord positions takes practice and time. But they can be very useful. When you can play barre chords, you can easily play all sorts of different chords. Your first finger acts as a capo across the fretboard. The other fingers play the chord shapes. A barre chord with a D chord shape on the fourth fret makes an E chord. There’s no easier way to play E on ukulele. As I said at the beginning, this is a very basic look at the practical aspects of transposition for ukulele. I’ll be writing more about transposition in a future blog post. 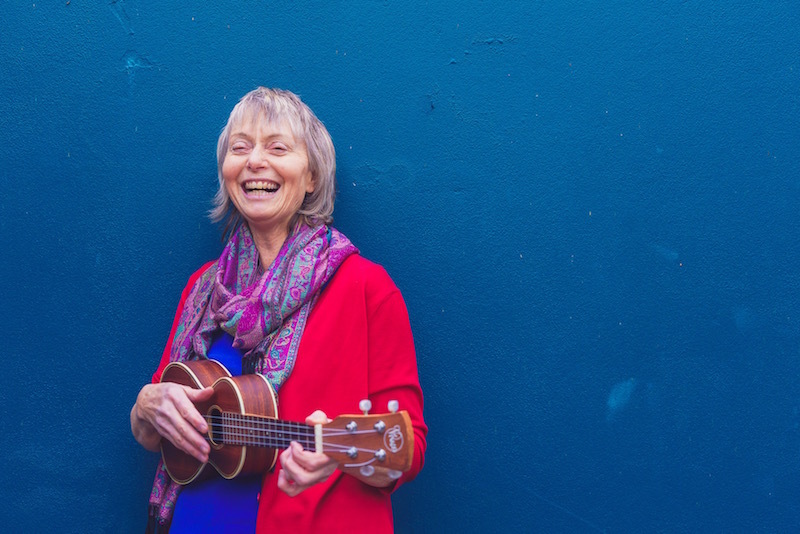 I’ve been in love with the ukulele since my mother, Sue, taught me three chords when I was six. I teach ukulele to people all over the world via Zoom and Skype. 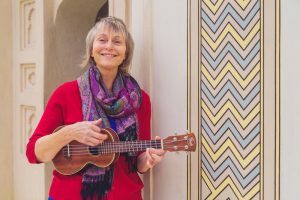 If you happen to live in Hamilton, New Zealand, I also teach group ukulele classes. You can find out about my group classes by clicking here. 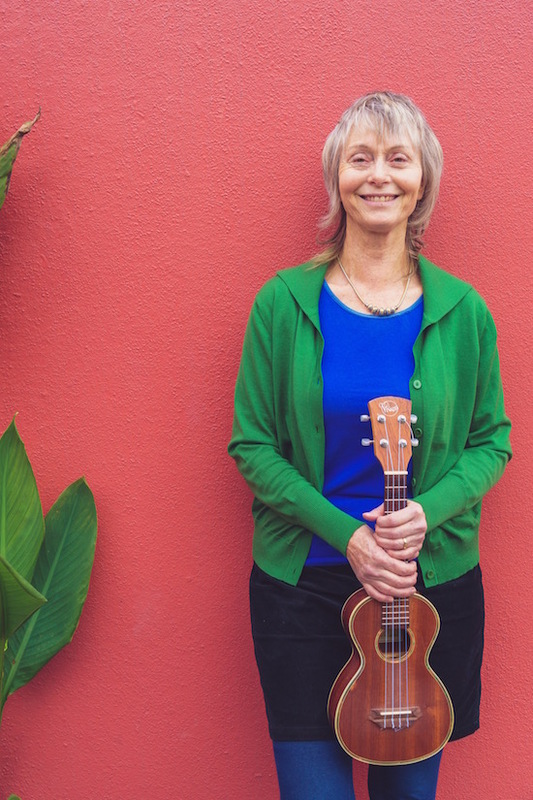 Sign up here and I’ll send you ukulele resources and videos. Strum your way to fun! Strum your way to fun! Sign up here and I'll send you a link to my ukulele practice videos. Even if you're a total beginner I'll show you how to quickly and easily start playing ukulele. You'll get the happy highs of music making!